DETROIT — For artist Mario Moore, it took getting brain surgery for him to allow himself a break. After a (possibly unrelated) seizure revealed a slow-growing astrocytoma, followed by an awake craniotomy, Moore found himself virtually unable to walk unassisted, needing to rely on the care of his girlfriend and capable of little more than pondering the particulars of healing. 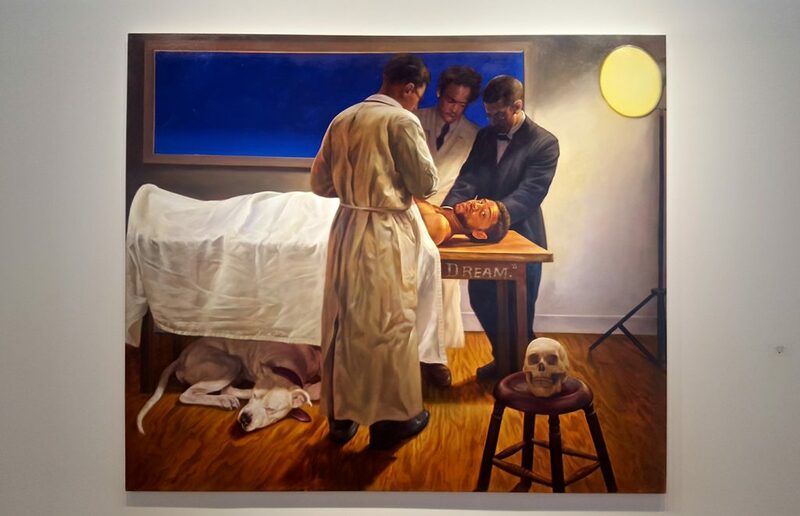 This stirred up a philosophical question for the young Black painter and Yale University graduate — one that, paradoxically, sent him straight back to work: When do Black men get to rest? “The entire show is about this idea of Black men resting and recovering,” said Moore, in an interview with Hyperallergic the day before his show of drawing and painting on the subject, Recovery, which opened to packed crowd at David Klein Gallery. In the resulting body of work, which has come together in less than a year since the August 2017 surgery, Moore explores this question of rest in a handful of ways — including a performance that took place at the opening. The imagery on display falls into roughly three categories: drawn and painted self-portraits, small paintings of friends, and drawings of Black icons at rest.